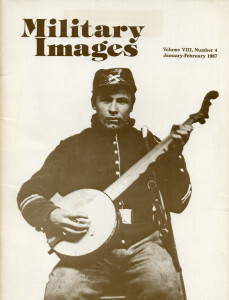 A Union cavalryman plays his banjo from a sixth-plate tintype from the collection of Ronn Palm. This issue of Military Images is the first that is made up of selected images from one collection: “The Best of the Palm Collection.” Many of the included items are from his wide variety of images featuring Pennsylvania troops. The editor asks for feedback on this idea of featuring one person’s collection in an issue. The five publications reviewed in this issue of MI begins with Historical Times Illustrated Encyclopedia of the Civil War, edited by Patricia L. Faust. This volume includes 2,000 entries that provide depth and detail that should appeal to the beginner and the experienced reader of Civil War information. It should be a companion to the Civil War Dictionary written by Mark Boatner. Second is The Cavalry at Gettysburg by Edward G. Longacre, who provides a long-needed description of the cavalry beginning in mid-June with Brandy Station through skirmishes leading up to the fighting at East Cavalry Field and the retreat ending in mid-July 1863. Longacre covers individuals like Stuart and Buford as well as others who are not as familiar to some readers. Third is The Fiery Trail, edited by Richard Harwell and Philp N. Racine, who take the letters and diary entries of Major Thomas W. Osborn of the Union Army of the Tennessee and provide them with detailed context and thus produce a detailed description of Sherman’s March. Fourth is The United States Navy: 200 Years by Edward L. Beach. Not intended to be a comprehensive history of the Navy, Beach looks at the people and incidents that had long-term impact on the future actions at sea, such as the fact that shots fired by the Monitor used only half charges. Last but not least is U.S. Army Uniforms and Equipment, 1889. This is a republication of the original Quartermaster Corps guide to all items ranging from barracks chairs to buttons, complete with line drawings and detailed descriptions. Collectors interested in this era’s items must have this publication. Readers provided a few corrections from the survey of corps badges in the previous issue. One reader included an additional example of the crescent badge as worn by XI Corps, while another identifies an “unidentified” officer. The very first issue of MI in 1979 included a selection from his collection, and this issue begins with an interview with Ronn Palm. He discusses how he began collecting Civil War images and how he began to specialize in certain types of images. Part of the interview covers how he stores his collection of over 2,200 images of all types, as well as where he finds new images. He has made friendships with many dealers and most of his transactions now involve trading rather than outright purchases. The cost of images, he said, can be discouraging to new collectors, but he provides some suggestions for how new hobbyists can begin. Ronn Palm’s image collection begins with 21 different images of Union soldiers who served in the infantry. The images range from carte de visite portraits of known and unknown individual soldiers to small group ambro- or tintypes images. A variety of uniform types and different weapons are displayed in these images. Most of the images have the typical backdrops used in period images, however one shows a soldier inside of a photographer’s tent, showing a very different glimpse of the era. This selection of 10 images is also a mixture of individual and group portraits, including one that looks like it was taken outside, almost giving one the sense that it was taken during action. The wide variety of fancy and plain uniforms is shown as well. A pair of soldiers from the 62nd Pennsylvania shows how the uniform of that unit changed, from the plain uniform worn by Private Willis T. Benedict in 1861 to the epaulettes worn by Sergeant Abasha Cowen during his third year of service as noted by the chevrons on his sleeve. Three images show both Union and Confederate prisoners of war. The group of five Confederates were held at Camp Douglas, Illinois, while the five Federal officers were held at Andersonville, Georgia. A single Connecticut soldier, Captain Billie Mays of the 23rd Connecticut, is shown upon his release from a POW camp in Texas; he has his gear and looks ready to go home. This section of the collection shows 22 different images of cavalrymen. Many of the images are individual portraits, with the first pages showing the men ready with a wide variety of weapons. While many of the men are unidentified, a few are known, such as Colonel Richard Rush and Captain Robert Mitchell, both of the 6th Pennsylvania Cavalry, also known as “Rush’s Lancers.” Palm’s collection includes some posed outdoor images with cavalry mounts, including two that show the same five men. In one image two are mounted while three lounge on the ground, their faces visible between the horses’ legs and bellies; they switch places in the next image. Colonel Alexander Hays and his staff (63rd Pennsylvania) are also featured in a half-plate tintype. The last five individual images in this section feature soldiers holding the M1855 pistol-carbine, a rare collector’s item and appears even more rarely in images, although it may be a photographer’s prop for these soldiers. Indoor, outdoor, and in a tent are where the images of musicians were taken for these two pages. Featuring a trio of horns, a drummer boy, a bugler, and a band outside at parade rest join a pair of older militia musicians with fife and drum. At one time, outdoor images were a passion for collector Ronn Palm, and it is easy to see why. The first image presented by MI here is captioned as being the “finest image” in his collection. It is a quarter-plate ambrotype of a company of Union soldiers lined up in an unidentified town. The detail provided by the civilians watching the soldiers in their ranks adds interest to the image for modern viewers. The other outdoor images featured include men relaxing (including one eating eggs with his meal), artillery at the ready, and two other units standing in ranks. One was taken shortly before the start of the Gettysburg campaign. The final selection of images from Ronn Palm’s collection includes 10 images of officers, both individual and group portraits. Two that stand out includes Captain John Laughlin of the 104th Pennsylvania who is the subject of a carte de visite while holding a model of a siege gun. The other is Lt. Col. J.W. Lyman of the 203rd Pennsylvania with his toddler daughter, Libbie; Lyman was killed at Fort Fisher in January 1865. A half-plate ambrotype image features a militia officer who looks a great deal like General Daniel Harvey Hill of the Army of Northern Virginia.